Osteria BALLA Manfredi is the result of the close collaboration between Architect Luigi Rosselli, Chef Stefano Manfredi and Restauranteur Julie Manfredi-Hughes. Luigi and Stefano have in common a Milanese origin. The Milano of Stefano and Luigi is the once industrial earth of Italy, its industrial architecture, space, honest and cognisant of the quality of materials. 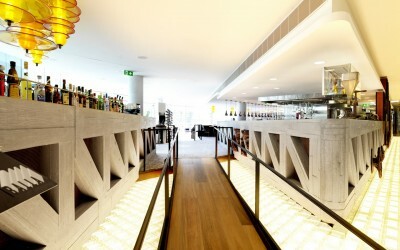 BALLA is a transposition of the life along Milan’s Navigli canals to the shores of Sydney’s harbour. Osteria BALLA’s namesake was the Milanese Futurist artist Giacomo Balla who co-signed the Futurist Movement Manifesto in 1909. The Manifesto is an ode to industry and machines, one hundred years later the machines and industry have left Milano but the Architecture remains, proud and beautiful. BALLA’s kitchen and bar are raised up from the main floor level and are framed by concrete trusses referencing the bridges that span over the Milano’s Navigli canal. Mild steel with visible weldings and fixings are used throughout the fitout referencing the steel industry of past Milano, and the wine storage inspired from factory floor pigeon-hole racks. 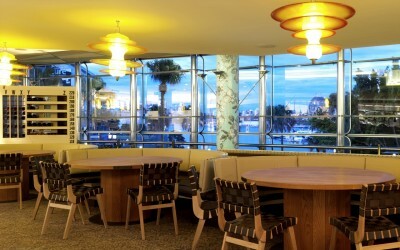 The waterfront side of the restaurant has come to be known as “The Avenue”. 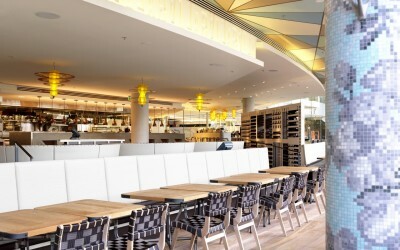 The Avenue is the connection between the inside of the restaurant and the larger waterfront landscape beyond the facade. 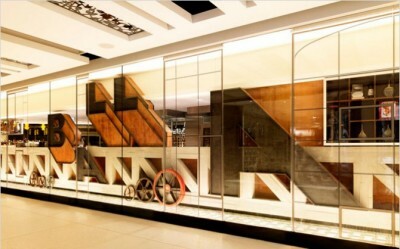 Its rhythm is set by the large structural columns located inside the operable glazing facade. 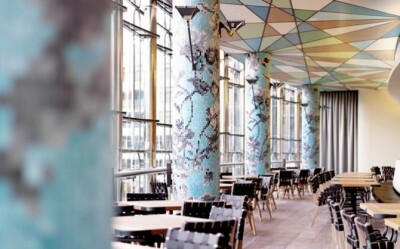 The columns are important links between the internal landscape of the restaurant, and the natural harbourside landscape. The columns are architectural trees, clad with a modern floral mosaic tile, and branched with industrial Lingotto light fittings designed by Renzo Piano. 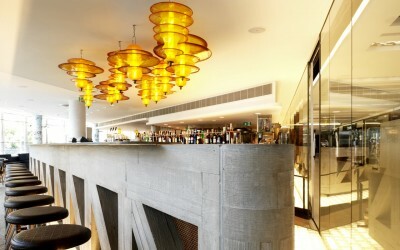 Arranged in Futurist inspired geometry, the multi-coloured ceiling panels above form a canopy of “foliage” and “sky”. Hand blown sculptural glass pendant lights by internationally acclaimed glass artist Dante Marioni hang from the ceiling adding a whimsical “feminine” glow to the otherwise masculine industrial fitout.